The economy in Colorado has been on a series of back-to-back strategic moves that have made the state a rock star of economic success over the last two years. 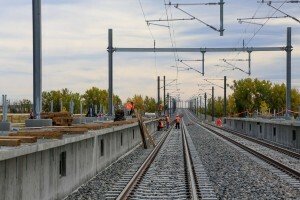 Ken Lund, the outgoing executive director of the Colorado Office of Economic Development and International Trade (Fiona Arnold replaced him in January of this year), says that one of the things that has fueled the economic growth for the state is infrastructure development — particularly light rail mass transit. “One of the lines (the 22.8-mile east rail line scheduled to open in 2016) coming out of downtown Denver Union Station will go directly to the airport, and there are a couple of stops along the way that will become a catalyst to be a sort of mass transit hub,” Lund says. It is 30 minutes from downtown to the airport on that rail line, which Lund sees as a tremendous opportunity for the talent who would work there and live there. The state is also seeing economic success stories being created as a result of incentives, such as the Advanced Industries Accelerator Act, which was passed two years ago. The economic development legislation is expected to create new highly-skilled jobs, increase exports, drive innovation and capital investment, create stronger partnerships between educational institutions and industry, accelerate technology commercialization and promote Colorado’s R&D activities. It is focused on seven advanced industries: aerospace, advanced manufacturing, biosciences, electronics, energy and natural resources, technology and information and infrastructure engineering. “Those industries represent about 10 percent of the U.S. economy and almost 30 percent of the Colorado economy,” Lund says. “Advanced manufacturing is a highly concentrated industry. So as a matter of strategic focus, those businesses become a very important part of the Colorado economy. The Gateway Park East Station Area Plan is the outcome of a planning process by the city of Aurora in partnership with Gateway Business Park. It will be the first FasTracks station encountered when leaving DIA. Lund says Colorado’s officials expect to see larger companies push big operations in the state, as well as continued growth of startup firms. A large company attracted to the state recently is Panasonic, taking advantage of the opportunities presented by the Denver International Airport and the coming light rail infrastructure, which is quickly making the airport a new hot spot for economic development. Panasonic Enterprise Solutions Co., a division of Panasonic Corp. of North America that develops, installs and maintains large-scale audio-visual solutions for business and municipal customers, will create a hub for its solutions business, and a technology center, creating 300 new jobs. It is expected to be completed by mid-2016. “This deal has been surprisingly speedy,” says Laura Brandt, economic development manager, Metro Denver Economic Development Corp. “It just ties together a lot of things and picks up on the various industry clusters we have, such as the sustainable community development that we are focused on in Colorado,” she says. Colorado’s workforce is highly educated, with 37 percent holding at least a bachelor’s degree, the second highest percent in the nation. By comparison, the national average is 29 percent. During the 2010-2014 period Colorado ranked seventh in the nation for the total number of Small Business Innovative Research grants and Small Business Technology Transfer grants, and sixth nationally for value of the awards. Colorado ranks third among peer states in federal R&D funding per employed worker, and ranks fourth in terms of academic research in the science and engineering fields. The Panasonic location is part of a 400-acre master planned, transit-oriented development called Peña Boulevard Station, which is being developed by L.C. Fulenwider, Inc. in conjunction with the Denver International Airport/City and County of Denver and two other land owners. Up in the northeast high plains of the state, 72 miles from Denver is Morgan County, where they are seeing an influx of oil field development, says Lindsey Bruntz, board treasurer for the Morgan County Economic Development Corp. This is a recent development in a large agriculture county known for sugar beet processing, milk production and cattle. The county has five industrial parks — the Fort Morgan park is full. “Our industrial park has just been bought out by Colorado Tubular Co., which supplies and builds tubes for oil,” Bruntz says. Other ag-based industry news is the processing of bison, she says, at the Bijou Creek Buffalo Ranch in Wiggins; along with Leprino Foods, a dairy manufacturer that just underwent a $90 million expansion to make string cheese. “We are also really starting to key in on health and wellness now,” Bruntz says, pointing to the multimillion expansion of the East Morgan County Hospital in Brush. He says the state has benefitted from many productive partnerships formed through the Colorado Innovation Network (COIN), and have brought most of the research universities and federal labs to the table to really focus on talent, both home grown and attracting from other areas. COIN was established in 2011 by Gov. John Hickenlooper to support and improve the Colorado innovation ecosystem. For 2012 and 2013, COIN worked with Colorado State University to establish a framework for evolving metrics used to assess innovation performance. “We have also partnered at the cabinet level with the Department of Labor and the Department of Higher Education, along with our office of economic development, to work on real actionable strategic planning to develop that talent pipeline from the skill training point as well as the strategic standpoint,” Lund says. Rail line under construction at 61st Avenue and the Peña Blvd. station near DIA. The station will act as the rail hub for planned mixed-use development coming to the area. 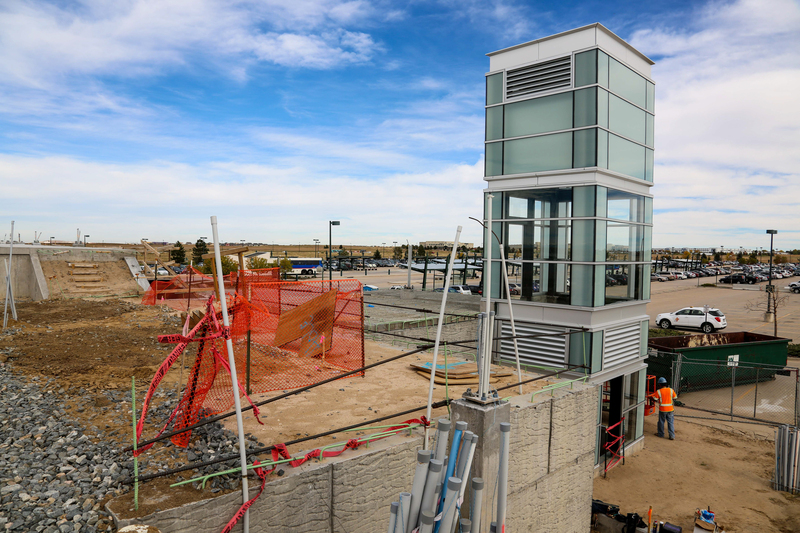 The soon-to-be-rail-accessible airport space is top of the agenda for many economic developers in Denver, and across the state. 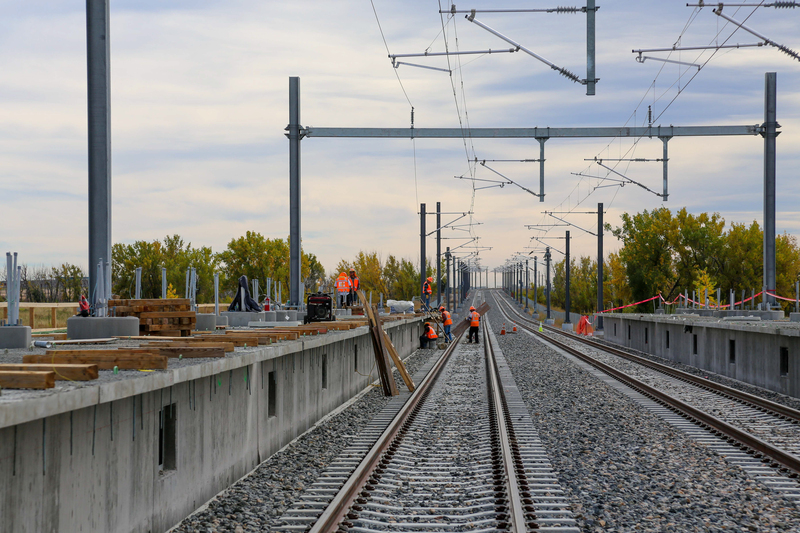 The rail line is part of the $2.1 billion Eagle P3 project. It’s the first public-private partnership of its kind in the United States. Development to come around the Peña Boulevard light rail station will include state-of- the-art treatments for creating mixed-use development, establishing walkable urban patterns that can literally be developed from the ground up, and potentially, some light industrial. Developers also believe that the proximity to DIA, which employs more than 35,000 people, makes this a highly desirable new community from the outset. Additionally, the Class C office space throughout metro Denver has been gobbled up by marijuana dispensaries, a new and fast-growing industry in the state, where companies have to grow the plant in the same space where they sell it. “It’s had a nice ripple effect because now we are seeing some Class A space being built, and, generally speaking, it’s leased before it’s in the ground,” Brandt says. She says that last time she looked, the industrial vacancy rate was less than 5 percent. Backpacking in national parks in Colorado is one of the great adventures anywhere in the country. An example is Great Sand Dunes National Park and Preserve in Mosca, located in the south central part of the state. This park boasts 30 square miles of sand dunes reaching heights up to 750 feet. A real treat is when the famous Zapata Falls, just 11 miles outside of the park, freezes into a 25-foot icy monument. Colorado is a state full of relatively remote rural areas — farming and other agriculture operations, and ski resorts — anchored by a few larger cities such as Denver (nearly 1 million population), Colorado Springs (nearly half a million population), Aurora (near DIA) and Fort Collins (home to Colorado State University). It is one of the fittest states in the country, with the population having access to all types of recreational activity including kayaking, hiking, mountain climbing and world-class skiing in cities like Aspen. The state is undergoing a sort of cultural renaissance now as more people flood into the state to take advantage of a generally positive economic development picture, with spikes of interest coming from larger ag and IT companies; and the rise of new businesses working on the development of alternative sources of energy, such as wind. Brandt says the Denver metro had a phenomenal year pretty much across the board. Her organization accounts for 1,600 new jobs from 26 projects in 2014, with $114 million plus in investment. “We are scrambling to keep up, frankly,” Brandt says. Morgan County Economic Development Corp.